I was in a good mood, so maybe that helped—some halo effect from a great day goin' on—but I thought it was pretty dang awesome. Several of us went, and everyone agreed "yep, something was missing," but whatever it was—that extra oomph—it was only subtly missing. It's very beautiful, as cinematography goes, and a great love story to boot, deeper and more 'connecting' than the actiony trailer made it out to be. I think you'll be pleasantly surprised, particularly if you like profile modeling in which a character stares into space while looking bronze and gorgeous. And also if you like Samuel L. Jackson when he dials things down, which he does here. He appears a decade younger than in The Hateful Eight, and avoids too many cheesy one-liners, which otherwise could have totally ruined the movie. He's seduced by a couple, but mostly avoids them. Oh, and there's a little history lesson in here, too, which was a nice bonus. Always interesting to learn more about colonial imperialism and cultural genocide. 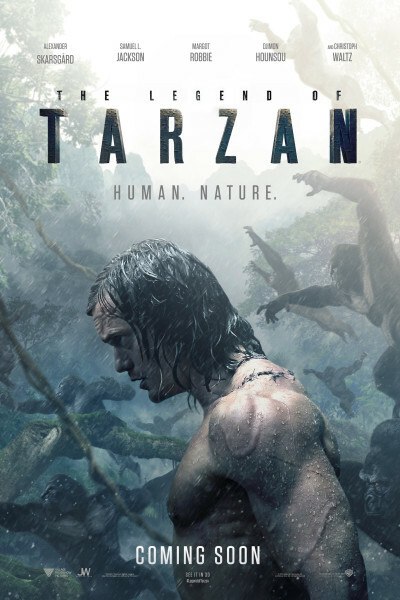 The Legend of Tarzan's got a couple jarring lines that are very inappropriate, and two steamy kisses, but is otherwise suitable for the young'uns in your tribe. Swing over when able; you'll be glad you did.